A broad insight into metamaterial technologies industry with respect to the extensive application spectrum and the appreciable contribution of major industry giants. The recent collaboration between Lockheed Martin & Metamaterial Technologies Inc. marks a breakthrough in metamaterial technologies industry. In June 2017, MTI, a smart materials & Photonics firm based in Canada, and Lockheed Martin signed a pact worth USD 5.6 million to develop a new product referred as metaSOLARTM, which assimilates advanced materials into its highly efficient, ultralight NanoWeb® technology that is likely to find applications across the aerospace, transport, and defense sectors. The product innovation drive by MTI unleashes the perfect blend of smart material technology with solar application fit to be used for aircrafts. With Lockheed’s support, this metamaterial technologies market giant aims to establish a strong position for itself in the solar business fraternity. This comes as no surprise, given that the utilization scope of metamaterials in the solar space is quite pronounced – as per estimates, metamaterial technologies market size from solar applications was worth more than USD 30 million in 2016. Recently, metamaterial technologies market was the spectator of another lucrative business deal. In June 2017, MTI and Satair Group had signed a MoU (Memorandum of Understanding), according to which MTI will provide its services to the civil aviation activities of the latter through its laser protection product referred as metaAIRTM. This product is reportedly a flexible metamaterial optical filter designed to be applicable on the inner surface of an airplane’s cockpit windscreen. It is also reported to help in preventing the entry of hazardous laser beams into the aircraft windscreen by deflecting them, in addition to offering optical protection such as ultraviolet ray protection to the aircraft cockpit during the daytime. Endowed with an abundance of such beneficial characteristics, the product is sure to garner widespread popularity, which in turn will create new growth avenues for metamaterial technologies industry players. The application of this product across the civil aviation symbolizes a new landmark achievement in the field of nanocomposites applications, which in a way, is likely to impact the growth landscape of metamaterial technologies market. Way back in June 2016, MTI signed an agreement to buy out Rolith Incorporation, a nanostructured equipment fabricator firm based in the U.S. The acquisition was aimed at increasing the metamaterial technologies industry behemoth’s abilities to manufacture metamaterial products for different sectors. In addition, the company aims to support various manufacturing units to produce optical metamaterials on a large scale, given the tremendous application scope of metamaterials across optical and acoustic products. Rolith’s RML (Rolling Mask Lithography) technology is projected to assist MTI’s operations and enrich its product portfolio. This strategic move has been predicted to support MTI’s endeavor to strengthen its leadership in the optical sector of metamaterial technologies industry. Metamaterials find wide applications across antennas, cloaking devices, radars, seismic protection equipment, absorbers, superlens, and sound filtering. Entrepreneurs have been attempting to innovate new technologies to expand the application spectrum of metamaterials across wireless communications and automobiles. A recent instance of the aforementioned statement is Metawave’s purchase of exclusive licensing rights to commercialize metamaterial applications across radars and antennas. It has been detected that metamaterials help in improving the radiating power and performance quotient of antennas. These software-controlled components incorporated in printed circuit boards also help in routing electromagnetic beams in ways that are perpetually impossible with other cost-effective systems. Metamaterial surface antenna technology improves the satellite efficiency subject to which its application in broadband mobiles and internet applications is quite pronounced. Metamaterial technologies market, despite being at a nascent stage, may observe a meteoric rise in the years ahead, given that these materials help in improving the functioning of GPS systems, airplanes, ground planes, wireless communications, space vehicle navigation, and space communications. Worldwide mobile wireless penetration is anticipated to hit nearly 100% by 2024, which, in all probability, will provide a rather colossal boost to metamaterial technologies market. Metamaterial technologies aid the enhancement of radar system performance fitted in drones or cars. Metamaterial technologies market players such as Metawave have been unearthing new ways to expand the application scope of metamaterials in radars, which is certain to augment the improvement factor in automobile-to-infrastructure communications and vehicle-to-vehicle communications for autonomous cars. An efficient radar system can help in reducing accidents through its smart sensing ability. 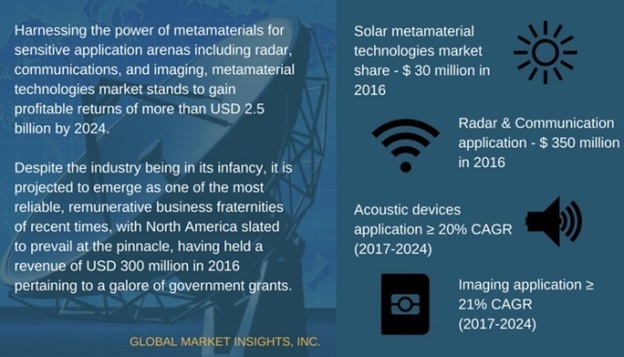 As per estimates, metamaterial technologies industry share from communication & radar applications was valued for more than USD 350 million in 2016, pertaining to the application of radars in space communication, GPS, and satellites in the commercial, civil and defense sectors. Metamaterial technology has the ability to control light and sound signals – it is capable enough to alter the color texture of the subject and enhance the ultrasound resolution quality. When incorporated in acoustic devices, metamaterials help in directing and manipulating sound waves across the solid and liquid mediums. These products also find applications across negative index materials due to their negative refraction property. Acoustic metamaterials control sound via chirality, bulk modulus, and, mass density, subject to which metamaterial technologies industry size from acoustic devices has been forecast to register a growth rate of 20% over 2017-2024. The usage of metamaterials in architectural acoustics, acoustic hyper lenses, sonar avoidance, and stealth technology will further augment the development of metamaterial technologies market from the acoustic sector. Metamaterial technologies market has already established a firm presence across North America – as per estimates, the region held a significant share of the industry revenue in 2016. With Canada and the United States at the forefront of research and technology innovation, North America metamaterial technologies industry is expected to register a valuation of more than USD 300 million by 2024. Extensive scientific research carried out in the field of medical applications of metamaterials will spur the expansion of APAC metamaterial technologies industry, which attained a revenue of more than USD 85 million in 2016. South Korea, China, Singapore, Japan, and India are predicted to influence the regional growth. Metamaterial Technologies industry is set to demonstrate a colossal growth across the globe over the years ahead. The bright future growth prospects of the industry can be mainly attributed to the rapidly expanding application scope of metamaterial technologies market. Unabatedly, the business stands to accrue large gains from myriad end-use sectors worldwide. Global Market Insights, Inc., claims metamaterial technologies industry to display an admirable growth rate of higher than 20% over 2017-2024, having produced a revenue of more than USD 500 million in 2016. Though metamaterial technologies market is highly fragmented, U.S based players such as Metamaterial Technologies Inc., Kymeta Corporation, Metamagnetics Inc., and Echodyne Corporation still hold an upper hand in metamaterial technologies industry share.